You are currently browsing articles tagged Upper Bucklebury. On Tuesday the Sense of Place team had another visit to the Berkshire village of Bucklebury to meet the local history group. This time we were joined by Rebekkah, MERL’s ‘Historypinner in Residence’, who has been helping us upload our content to Historypin and develop a Historypin App for Bucklebury which draws on the content from our Historypin channel and from the Bucklebury History Group’s channel. 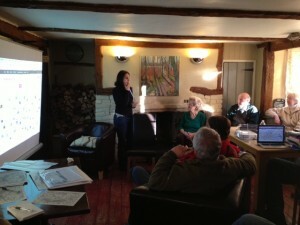 We met up with the Bucklebury History Group in a cosy pub in Upper Bucklebury and set ourselves up for an afternoon of ‘crowdsourcing’. Crowdsourcing is a form of distributed problem solving, which basically means putting a problem into the public domain for anyone to solve. In our case, we were using crowdsourcing to find out more about our Bucklebury photographs from the History Group. We selected about 20 Bucklebury images – some taken by Philip Osborne Collier, a Reading photographer who was active 1905–1960s, and some taken by a former resident of Bucklebury in the 1950s. We chose these images for several reasons, e.g. because we wanted to know where they were taken, because we wanted to know who was in them, because we thought they were nice photographs, because we thought they might spark off interesting discussions etc. We were particularly keen to get more detailed information on where the photos were taken so that we could pin them more accurately to Historypin, and thus paving the way for making use of some of Historypin’s other functions, such as taking repeat photos which allow you to fade between historic and contemporary photos of the same view. One of the Collier photos we crowdsourced, showing the houses near Turner’s Green and George Lailey’s hut in the distance. The session was a great success! We had been planning to work in two smaller groups to try a couple of different ways of looking at the photos and recording the information, e.g. looking at the photos on laptops and on print outs, and recording the information on blank pieces of paper and on prepared forms. However, we ended up working together, gathered around a big screen onto which we projected the images. I acted as a scribe, scribbling down as much as I could about what was being said; Felicity sat with a map next to a very knowledgeable Bucklebury resident and recorded the location of each photo; and we had a dictaphone running to record any information we missed. The great thing about this was that everyone could pool their knowledge together and looking at digital images meant we could zoom in on particular areas of the photos (which were very high resolution) which we wouldn’t have been able to do had we been using printed photos. 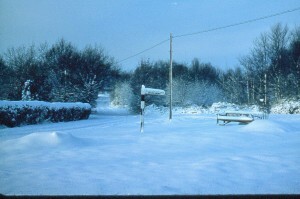 This photo was given to the History Group by Rod Bisset, who grew up in Bucklebury. 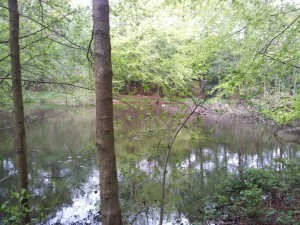 Felicity has managed to pin this to Historypin – the small tree by the bench is now a very large tree! As a result of the crowdsourcing session, we now have much more accurate information on where the photos were taken and Felicity has been spending the day re-pinning the photos to the correct places. We’ve also generated some more contextual information about the photos, which Rebekkah is going to work on uploading as stories. We’ve also learnt how a crowdsourcing session actually works. Crowdsourcing is something Rebekkah does quite frequently for Historypin, but none of us had ever tried it before, so it was really good to give it a go and get some ideas on what worked well and what didn’t work so well, which can feed into other crowdsourcing sessions. I think that was probably the most positive outcome – that the Bucklebury History Group would like to do another session, so that’s hopefully something we’ll do in the spring. We’re also hoping to use what we’ve learnt to run a crowdsourcing session to look at some of the other photographic material we have at MERL – in particular, holding an intergenerational session with Young Farmers (and older farmers) to look at photographs from Farmers’ Weekly. We had also been hoping to trial the Bucklebury App while we were there, but unfortunately I couldn’t get enough 3G signal for it to work reliably. I did manage a quick go using the pub’s wifi and was really pleased with what I saw. We’ve still got some more work to do on the App before we’re ready to make it public – including making use of the more accurately pinned photographs, and developing collections – but we’ll keep you posted on that. Finally, I’d like to say a big thank you to Helen Relf of the Bucklebury History Group for making the arrangements for the session, and to Rebekkah for coming along and showing us how to crowdsource! And, to end on a positive note, one of the photos from the History Group’s channel is Historypin’s ‘Pin of the Day’ for today (17 January) so be sure to take a look. Since we’ve gone a bit quiet about our progress on the cataloguing front recently, I thought I would let you know how we’ve been getting on over the past month or so. We have slowed down somewhat as other aspects of the project start to pick up pace, but our current total sits at just above 4,500 records. Initially progressing chronologically, we have worked through the records from 1951, when the Museum was founded, to 1954 in full, and have also completed parts of 1955 and 1956. More recently, though, our focus has shifted to other areas of the collection. Greta has been working her way through the Museum’s collection of baskets (about which I think she is planning a separate post), whilst Danielle and I have been completing the objects in the collection from the Berkshire village of Bucklebury, in preparation for our work with Historypin. There are between 300 and 350 objects from Bucklebury in the collection. It is hard to give a more precise figure, because more information becomes available as we work our way through the records. We have just one object record file for objects from the Hedges Foundry, for example, but this actually relates to 26 individual wooden patterns. In addition to the objects from the Hedges Foundry, which was situated in Bucklebury Village, much of the rest of the material comes from the bowl turner George Lailey and the handle maker Harry Wells. I spoke in a previous post, Cataloguing ‘place’, about our geographical hierarchy, which is largely based on the Getty Thesaurus of Geographic Names, with a few alterations and additions. In the case of the Bucklebury material, we have decided to add still further levels of detail into our hierarchy. This reflects the fact that we are in a sense using Bucklebury as a trial area, exploring some of the ways in which this approach can be implemented in collaboration with local communities, and we want to make our hierarchy as relevant as possible to their understanding of ‘place’ in Bucklebury. Of course, in order to do this, we had to get a good grip on how ‘Bucklebury’ works, which was one of the main reasons for our visit a few weeks ago. When we first met the Bucklebury History Group, I naïvely asked ‘So, how exactly is Bucklebury laid out?’ My question was met with knowing smiles. We had a look at a huge map of the parish, and immediately saw part of the problem, which Danielle also described in her earlier post, The Bucklebury Experience. Bucklebury Village itself, situated on the banks of the River Pang, is actually quite small. Upper Bucklebury, where many of the more modern houses are situated, is up to two miles away down narrow country lanes, in the middle of the Common. A further hamlet, Chapel Row, sits to the eastern edge of the Lower Common. A smaller hamlet, The Slade, sits on the western edge of the Upper Common. And then, dotted in between, are other clusters of houses, each with distinct names and identities, but all considered to be a part of ‘Bucklebury’. These include Turner’s Green, where Lailey’s workshop was situated, Byles Green, Miles’s Green, Workhouse Green, and the grandly named hamlet of ‘Scotland’. Knowing this, it seemed insufficient to give ‘Bucklebury’ just one listing in the hierarchy. Besides, the given latitude and longitude on the Getty Thesaurus was situated in a somewhat obscure spot in a field in the parish, which hardly seemed to reflect the complexity of the village’s geography. 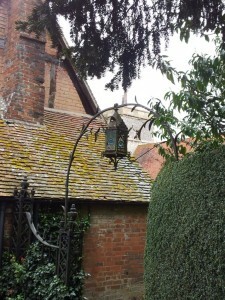 Our tour of Bucklebury was incredibly useful. Physically walking and driving around and between the places in Bucklebury gave us a far better understanding of the place than simply looking at a map. Obviously this approach is impossible on a larger scale, but for the purposes of our work with the Bucklebury History Group and Historypin, it was invaluable. The hierarchy we have come up with will hopefully enable the collections to be pinned to the map with as much accuracy as possible, reflecting the level of information we have about places in Bucklebury. The broadest ‘Bucklebury’ thesaurus term in our hierarchy relates to everything within the parish boundary. At a lower level, we list the larger distinct places: ‘Bucklebury Village [Bucklebury]’, ‘Chapel Row [Bucklebury]’, ‘Bucklebury Common [Bucklebury]’ and ‘Upper Bucklebury [Bucklebury]’. Some hamlets, such as ‘Bushnells Green [Bucklebury]’ are also listed at this level because they are isolated within the parish, but other hamlets, such as Turner’s Green are first linked to bigger places with which they are associated. 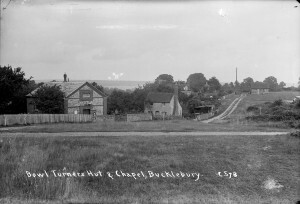 For example, Turner’s Green is situated on the Common, so is listed as ‘Turner’s Green [Bucklebury Common [Bucklebury]]’. The essence of our approach is to include as much detail as possible, so that we can find the precise latitude and longitude for distinct villages, hamlets, and even houses, which will ultimately enable the collections to be mapped as accurately as possible to the places with which they are associated. It does feel as though we might have picked the most complicated village in England to use as a case study, but perhaps I am just expecting (or even hoping for) a logical simplicity that simply doesn’t reflect the realities of place.